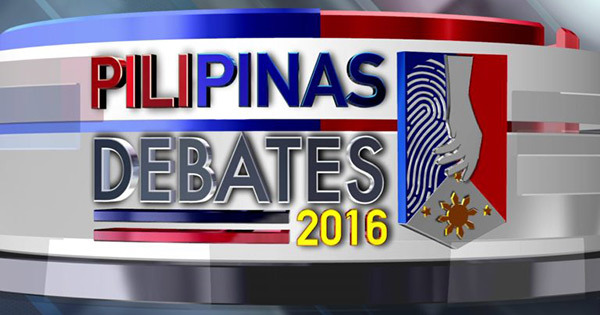 The third and final leg of Pili Pinas 2016 presidential debates takes place Sunday, April 24. Here's how to watch it via live streaming. Presidential front-runner and Davao City Mayor Rodrigo Duterte and his opponents—neophyte Senator Grace Poe, Vice President Jejomar Binay, former DILG Secretary Mar Roxas, and veteran lawmaker Senator Miriam Defensor Santiago—will meet again this weekend to discuss their platforms of government and to talk about relevant and pressing issues facing the country. Pili Pinas 2016 presidential debate will be aired live from the Phinma University of Pangasinan over ABS-CBN, ANC, DZMM TeleRadyo, DZMM on AM radio, and online via news.abs-cbn.com, iwantv.com.ph, and mb.com.ph. According to the Kapamilya network, smartphone users can also watch it using the iWant TV app while ABS-CBNmobile prepaid subscribers can view it by texting <IWANTV10> to 2135 for 1-day full access. Just choose livestream via ABS-CBN HD or regular ABS-CBN stream. Filipinos abroad can watch it via TFC, the Filipino Channel, and it will also be streamed live on IPTV and TFC.tv. The third presidential debate, to be moderated by ABS-CBN's top broadcast journalists Karen Davila and Tony Velasquez, will have a town hall format. Ordinary citizens representing various sectors of the society get to ask questions about public transport and traffic in Metro Manila, job security, health, foreign policy, basic public education, OFW concerns, and peace for Mindanaoans in conflict areas. In the face-off round, a candidate may grill an opponent on their ability to govern and lead, according to a press release. ABS-CBN, Manila Bulletin, KBP and the Commission on Elections (Comelec) organized the 2016 Presidential Town Hall Debate.